It’s been a drizzly couple of days, and the plants are eagerly soaking up all the moisture. The landscape is filled with vibrant shades of green. The romaine is practically luminescent. I’ve written a bit about Coppertop’s great water systems in my journal post, H2O. Since mid-March when we turned on the hoses leading from the well pump to the outdoor water system, we’d noticed an area of the fenced veggie garden very close to the raspberry trellis that didn’t drain well. I’d avoid stepping there because it was a struggle to lift a foot out of the mire without losing a boot. At first it was difficult to tell if this was simply a low spot in the garden where springtime rain was collecting on the grass pathway. After a week of warm, dry weather when the huge puddle hadn’t soaked in, I became convinced we’d sprung a leak in the underground pipes leading to the spigot between the raspberries and the orchard. This spigot, one of nine outdoor ones that make things convenient here, is usually attached to a hose and sprinkler for the veggie garden or can be attached to the raspberry soaker hose. In other words, this is an important spigot. 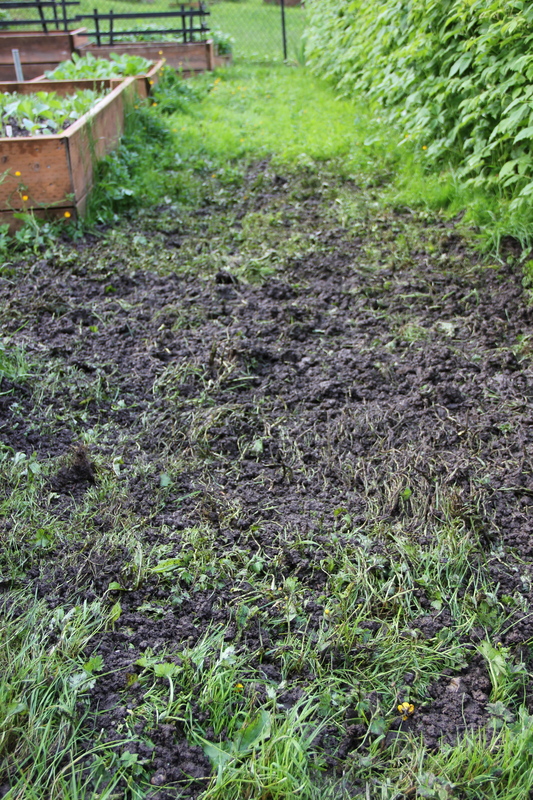 So, Hubby donned his muck boots and dug up a large patch of grass and an immense amount of soggy, HEAVY earth in the veggie garden this long weekend. Messy work! He uncovered a loose pvc pipe fitting about two feet directly beneath the puddling area. He was able to fix the leak with a new pipe coupling from our friendly neighborhood hardware store. He filled the hole before I could get a photo, but not before I viewed a great underground cross-section of soil — what a paradise of rich treasure teeming with wriggling life! While Hubby got grubby, I admit I stayed cozy in the greenhouse, transplanting more tomatoes and peppers while listening to the rain pitter patter on the roof. I did venture out to cheer him on, and I made him some killer chili one night, and barbecued ribs the next. Gotta keep his strength up for the next challenge. For now, it isn’t pretty, but there’s no puddle, and I’m so thankful it’s fixed! 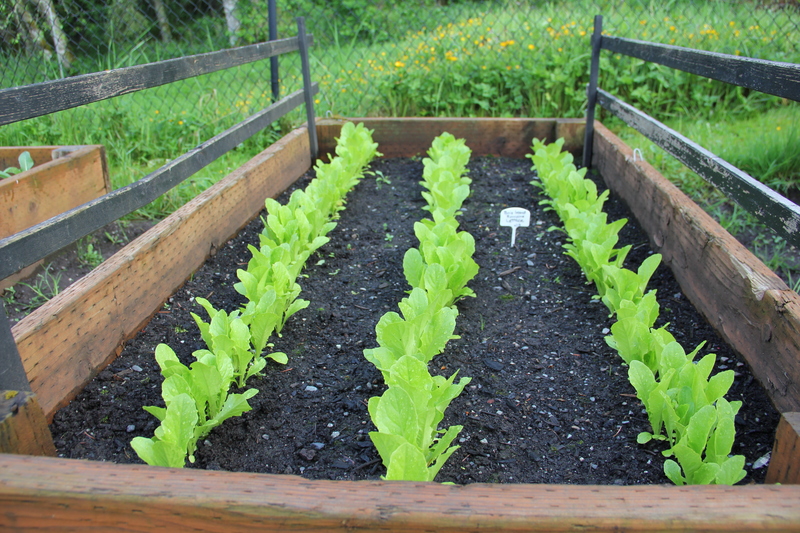 This entry was tagged broken pipes, Coppertop, gardening, Olympic Peninsula, Romaine lettuce, sprinkler system, well. Bookmark the permalink.